Our latest recruit, Jade, is very enthusiastic and keen to settle into the New Zealand way of life. 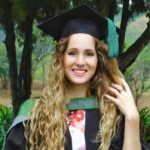 After achieving Honours in BSc Geoinformatics at the University of Pretoria in South Africa, Jade was eager to explore the world and find greater opportunities and ways of increasing her knowledge and skill base. Now working for GBS, Jade is keen to extend her passion in GIS with spatial innovative thinking and new ideas. In her spare time she enjoys gardening, painting, writing and even a bit of crochet.